This is a lovely simple supper which is a nice tasty beginning to Lent. Meanwhile heat a wok or large saucepan with a little oil and add in the crushed garlic, onion and mushrooms and sauté gently for 3-4 minutes until the vegetables are softened. Increase the heat and add in the prawns and cook for a further 2-3 minutes. Add in the lemon juice at this stage and season lightly with a little salt and pepper. Break the broccoli into small spears and add them into the dish at this stage. Next add in the yogurt and sweet chilli relish and allow this mixture to come to a gentle boil. Simmer for a further 2 minutes. 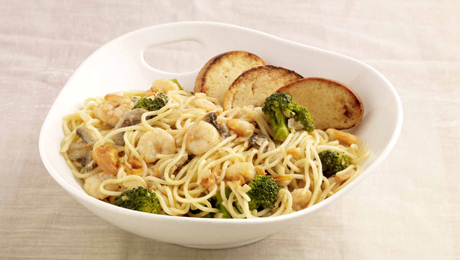 Drain the spaghetti into a large colander and toss into the simmering prawn mixture, mix well to ensure it is thoroughly coated. If required season with black pepper before serving and serve with some freshly grated parmesan cheese (if using). Place the chopped tomatoes in a medium saucepan with the sugar, vinegar, roughly chopped garlic and chilli powder. Bring the mixture to the boil and then reduce to a gentle simmer for approximately 15 minutes. Transfer the entire contents to a food processor and blitz until smooth. Add 4 tablespoons as required above and store any left over relish in the fridge in a sealed container. This will keep in the fridge for 1 month. Leftover relish can be mixed into some mayonnaise and used as a spread for tasty sandwiches or baguettes.